What If Rickrolling Is Just Karmic Retribution For Rick Astley Not Getting To Celebrate His One Major Award? 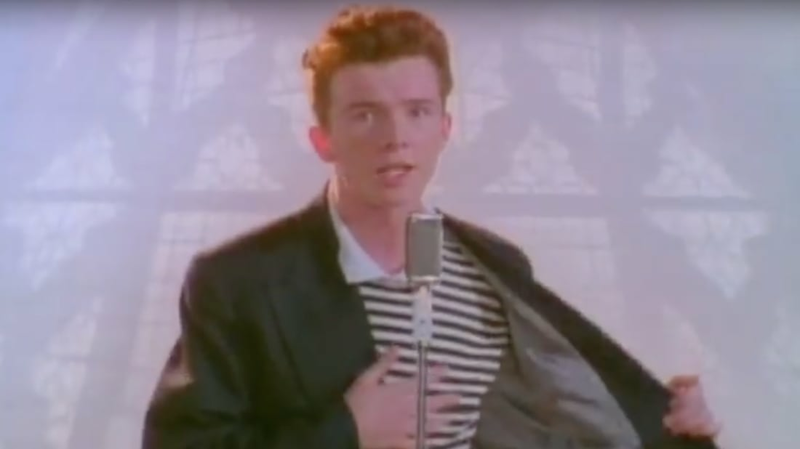 In 1987, Rick Astley was a baby-faced 21-year-old with an unexpectedly deep baritone who was having a really stellar year. Not too long before, he’d been a teenage drummer on the club circuit who was scouted as a singer by the up-and-coming songwriting and production team of Stock Aitken Waterman (who were responsible for the recent hits "You Spin Me Round (Like a Record)" and "Venus"). Astley's new studio groomed him to be a star, and his first solo single, “Never Gonna Give You Up,” was an instant success. Released in August, the song immediately dominated five weeks on the UK charts. It quickly spread, becoming a global number one hit in 25 countries, and eventually topping four U.S. Billboard charts. By year's end, it was named the best-selling British single of the year. And yet, when awards season rolled around, only Astley's native Great Britain took notice. Though the song was a hit and its album, Whenever You Need Someone, eventually went double-platinum in the States, Astley was shut out of the Grammys. But at the Brit Awards, the singer was nominated for Best British Male Artist, Best British Newcomer, and Best British Single. On February 8, 1988, just two days after Astley’s 22nd birthday, he won the only major award of his career: Best British Single, for what would become his signature song. Astley had been seated in a box at the Royal Albert Hall, though, rather than at one of the tables on the floor. And, as televised awards shows are wont to do, the show was in danger of running over time. With The Who scheduled to close out the show—it had been a significant feat to get them to perform together for just the second time in six years—former BPI chairman Rob Dickins decided to storm the stage to save time. “I said we had to cut the last award to get The Who on stage,” Dickins recalled last year. “The producers and [the host] Noel Edmonds said no … and I flipped.” In footage from the night, you can see Dickins nervously stepping around the side of the stage, wanting to rush the presentation to make way for The Who, while Edmonds begins introducing the category. While the prerecorded footage of the five Best Single nominees rolled, Dickins made it clear that they would not be making time for the winner to come to the stage. Edmonds got the hint, and after announcing Astley’s win, immediately called Dickins to the podium. “Poor Rick Astley never got to collect his award for best single, and ended up in tears,” host Noel Edmonds later said. Poor Rick Astley indeed. He continued to release new material and still makes appearances at festivals and fundraisers, and though his next nine singles all hit the UK Top 10, he largely fell from the mainstream in the U.S. after his single "Together Forever" topped the U.S. charts in the summer of '88. That is, until 2007, when a 4chan user created everyone's favorite Internet prank: Rickrolling. By 2008, the meme had gone viral, and suddenly any important story or video you thought you were going to see was suddenly hyperlinked to the very '80s video featuring Astley's rich vocals and sweet dance moves. "It’s funny," Astley told the Los Angeles Times in 2008. "It makes me laugh—I’m sure it really annoys a lot of other people—but it’s made me laugh occasionally." And perhaps it's for the best that Astley is getting his last laugh now. Because even if his one big award show moment was stolen from him, at least he's living on in Internet infamy, and, in a sense, stealing the spotlight from … Who knows?